Israeli armed guards stormed the prison sections of the Palestinian prisoners of the Popular Front for the Liberation of Palestine on Tuesday, 14 June, assaulting prisoners, imposing sanctions, and confiscating electrical appliances. This attack came after the PFLP prisoners announced their first of three scheduled two-day hunger strikes demanding the freedom of Bilal Kayed. Kayed, 34, was scheduled for release on Monday, 13 June after the expiration of his 14 and one-half year sentence in Israeli prison; instead, as his family waited at the checkpoint to receive him, he was ordered to six months administrative detention – imprisonment without charge or trial. Prisoners have declared a series of escalations and protests inside the prisons demanding Kayed’s freedom and an end to administrative detention. The Wadi Hilweh Information Center in Silwan (Silwanic) has reported that the soldiers invaded homes in the al-‘Eesawiyya town, in the center of Jerusalem city, and kidnapped two Palestinians, identified as Rami Mustafa and Azmi Mustafa. The soldiers also invaded Anata town, northeast of Jerusalem, and kidnapped one Palestinian, after storming his home and searching it. The soldiers also invaded several neighborhoods and towns, in the Jerusalem district, especially Anata, Shu’fat, Silwan and Abu Dis, and clashed with local youths who hurled stones on the military vehicles. In addition, the soldiers invaded Beit Fajjar town, south of the West Bank city of Bethlehem, searched a few homes and kidnapped a young man, identified as Ahmad Nasr Thawabta, 19. Local sources said that clashes took place in the al-Mothallath and the Municipality areas, after the soldiers invaded them. Youngsters hurled stones on the military vehicles, while the army fired gas bombs and concussion grenades. 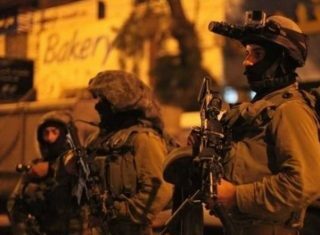 Also at dawn, the soldiers invaded several Palestinian communities in the northern West Bank districts of Nablus, Jenin and Tulkarem, searched many homes, and kidnapped six Palestinians. On Monday evening, two Palestinian security officers were injured after a number of fanatic Israeli settlers hurled stones on their car, driving on the Yitzhar road, south of the northern West Bank city of Nablus. OCCUPIED JERUSALEM, (PIC)– Reports have recently been released by Israeli pro-settlement groups on an Israeli plan to build 258 illegal settlement units in Occupied Jerusalem. These groups, one of which is affiliated with the Israeli army, said the planning committee in Occupied Jerusalem will discuss a scheme on Thursday June, 22 to build 258 settlement units on Palestinian lands in the villages of al-Issawiya, al-Tur, and Lefta. 734 dunums of Palestinian lands have been confiscated by the Israeli occupation authorities to establish the projected Jewish settlement outpost. At the same time and as the plan shows, ties between Palestinian towns and villages will be cut from limb to limb as a result. The project also includes a park, a garden, and a school, along with a synagogue in its second phase. The project will bring the number of the demolished Palestinian homes between al-Issawiya and al-Tur to 23. Over recent years, the Israeli occupation municipality has often turned down Palestinians’ appeals to register their lands in the estate department in favor of illegal settlement outposts and Judaization projects. BETHLEHEM, (PIC)– Israeli Occupation Forces (IOF) arrested on Tuesday the mother of the Palestinian prisoner Mousa Awwad, and two Palestinian workers after attempting to enter Occupied Jerusalem. The PIC reporter said that the IOF arrested the mother of detainee Awwad, who has been detained for five years, during family visitation in the Negev jail and took her to an unknown destination. Israeli forces also rounded up two Palestinian workers: Samer Salah and Ibrahim Salah during their attempt to enter the city of Occupied Jerusalem where they work. Both of the arrested men are ex-detainees in Israeli jails where they had served over four years. AL-KHALIL, (PIC)– Israeli military court of Ofer sentenced on Monday the Palestinian prisoner Shadi Mutawe, 28 years old, to life imprisonment for three times after “convicting” him of killing two settlers in southern al-Khalil last December. The PIC reporter revealed that Israeli forces arrested Mutawe on December, 14, 2015 after carrying out a shooting attack at the settlers’ car. He underwent a long-term investigation and waged a 25-day hunger strike due to the maltreatment he was subjected to during interrogation. Iran’s Academy of Medical Sciences has condemned the United Nations’ recent decision to cave in to pressure by Saudi Arabia over the blacklisting of the Riyadh regime for killing children in Yemen. In a letter to UN Secretary-General Ban Ki-moon on Tuesday, President of the Iranian Academy of Medical Sciences Seyed Alireza Marandi denounced the world body’s silence on the Saudi atrocities against Yemen’s civilian population. “The United Nations was set up explicitly and primarily to ensure peace and stability. Instead it has become an organization that is enabling and prolonging war,” the letter said. Earlier this month, the UN blacklisted Saudi Arabia after concluding in a report that the Riyadh was responsible for 60 percent of the 785 deaths of children in Yemen last year. A few days later, however, the world body announced that Saudi Arabia would be scratched from the list of shame pending a joint review with the kingdom. The UN chief said he temporarily removed Saudi Arabia from the blacklist because Saudi Arabia’s supporters threatened to stop funding many UN programs. The letter by the Iranian medics described the blacklisting “a very small but positive move” more than one year after the beginning of the “illegal” Saudi campaign, adding that the move was welcomed by the international community, except the United States and other Saudi allies. “However, to our utter shock and amazement, less than a week after the listing, the Saudi regime’s name was removed from the list. Most tragic of all was your personal admission that this decision was made after several members threatened to end their donations to the United Nations,” the letter says. They also criticized the Saudi blockade on the impoverished country, preventing medical and food supplies from reaching millions of Yemeni people. “We believe that the United Nations belongs to all nations, but by your own admission, today wealth and power determine the decision making process in this organization. … It seems that the United Nations has practically admitted the loss of any moral legitimacy,” the letter adds. The letter is the second such text sent by the Iranian medics to the UN chief over the Saudi war on Yemen. Saudi Arabia launched its military aggression against Yemen on March 26, 2015, in a bid to reinstate former President Abd Rabbuh Mansur Hadi, a staunch ally of Riyadh. More than 9,400 people have been killed and at least 16,000 others injured in the Saudi offensive. AL-KHALIL, (PIC)– Israeli bulldozers at dawn Tuesday demolished, under military protection, a water well and a cattle shelter in Yatta town, south of al-Khalil, at the pretext of unlicensed construction. Anti-settlement activist Rateb al-Jabour said that the demolished structures belonged to Odeh Abul-Zait and Mahmoud Noa’man. Jabour told Quds Press that the Israeli army also notified Mohamed Rab’iee of its intention to demolish his water well in al-Rafa’iya area to the east of Yatta. In another context, the Israeli army prevented dozens of Yatta workmen who hold work permits from going to their workplaces, according to the activist. Jabour accused the Israeli army of pursuing a mass punishment policy against the Palestinians in Yatta following the recent Tel Aviv attack that was carried out by two local young men. AL-KHLIL, (PIC)– Throughout the summer months, hundreds of thousands of Palestinians in the West Bank suffer a severe shortage of water and it is getting worse year after year, as the result of Israeli policy of unfair allocation of water resources in the West Bank. The Palestinian Water Authority (PWA) stated that Palestine suffers from the unfair distribution of water sources, which remain under almost full Israeli control, in total violation of the international law. According to the Palestinian Central Bureau of Statistics (PCBS), 51 million cubic meters were allocated for Palestinian farmers in 2011 while 1,042 million cubic meters were allocated for the Israelis during the same reported period. The 1993 Oslo Peace Accord stated that the Palestinians should yearly have 118 million cubic meters; however, they are currently using 87 million cubic meters of water. Israel exploits approximately 80% of the renewal water resources, while the Palestinians the remaining 20%. Director of the PWA Essam Arman charged that the water shortage crisis in West Bank is a political crisis par excellence as Israel has taken advantage of its control of the West Bank in order to appropriate more water sources and to prevent Palestinians from developing new water sources that are under the land. The southern villages of al-Khalil are the most affected areas by water crisis, he pointed out. Local residents have been complaining and protesting for more than two months against Israeli control over the water sources. The residents stated that they were forced along the past four weeks to purchase high-priced water especially during the holy month of Ramadan. According to the Israeli leftist organisation B’tselem, the discrimination in utilization of the resources shared by Israel and the Palestinian Authority is clearly reflected in the figures on water consumption by each population. Daily per capita water consumption in the West Bank for domestic, urban, and industrial use is some 73 liters, while per capita water consumption in Israeli towns is 242 liters and in local councils, 211 liters. In other words, per capita use in Israel is three and a half times higher than in the West Bank, B’tselem underlined. Under international law, Israel is committed to supplying drinking water to the Palestinians and not denying them. Vice-president of the Syrian Coalition Muwaffaq Nyrabiya said that the Brussels meeting between the Coalition and the National Coordination Commission has laid the groundwork for more effective mechanisms of joint action aimed at unifying the ranks of the Syrian opposition. The meeting between the Coalition and the opposition body the National Coordination Commission began in Brussels on Monday and is scheduled to conclude on Wednesday. “In addition to the importance of reaching a deeper understanding between these two major opposition bodies with regard to the political process, the main goal of the meeting is to further unify the Syrian political opposition and lay the foundations of more effective mechanisms of joint work,” Nyrabiya said. Nyrabiya expressed hope that the meeting will result in drawing up a new national document developed out of the national covenant document issued after the Cairo Conference in July 2012. Nyrabiya pointed out that this meeting is important to the struggle against the Assad regime, but also is a necessary step to overcome potential future challenges; in particular tyranny and extremism. The opening session of the meeting, which was attended by the EU Secretary-General for External Action Service, Alain Le Roy, stressed the need for stepping up efforts to reach a political solution in Syria that achieves the aspirations of the Syrian people and puts an end to their suffering. Cairo – Deputy Prime Minister and Foreign Minister Abdul Malik al-Mekhlafi, who is also heading the government delegation at the peace talks in Kuwait, said that UN Special Envoy Ismail Ould Sheikh had not presented his suggested road map yet. Mekhlafi expected the road map to be presented during the coming two days. “In any case, the international community remains committed to Resolution 2216,” Mekhlafi said, adding that Houthis thought they would come to Kuwait to legalize their rebellion. Mekhlafi confirmed that Resolution 2216 was issued under Article Seven and is binding. He indicated that the international community wants a peace process which requires certain compromises. Mekhlafi continued to say that the insurgents thought they could gain something on the political level in Kuwait to compensate their failures in war. The Houthi delegation returned to square one in the Yemeni – Yemeni peace talks in Kuwait after rejecting efforts of UN envoy and all other countries sponsoring the peace process in Yemen. The delegation issued a statement rejecting all previous agreements and all efforts exerted for over 50 days during the peace talks in Kuwait. In light of what insurgents declared in their statement, Yemeni sources considered it as an attempt to vacate the presidency and turn Kuwait talks into “reconciliation”. Yemeni source told Asharq Al-Awsat newspaper that main demand of the legitimate government is for the insurgents to hand over their weapons. Sources close to the Kuwait talks refused to consider the recent change in position of the insurgency delegation as a failure of the talks. According to sources, it is possible that countries sponsoring the peace process in Yemen will initiate a one-sided initiative in Yemen, after they were relying on a comprehensive solution. Also, sources revealed that all parties are now familiar with all aspects of the solution plan for Yemen to be released soon. During a meeting with Legitimate Yemeni leadership, President Abd Rabbo Mansour Hadi briefed the attendees on the current situation, developments, and efforts to reinstate peace according to Resolution 2216, Gulf Initiative, and National Dialogue. Yemeni President said they look forward for peace to establish a secure future for the coming generations. Saba news reported that the president met with committee of advisors and listened to an extensive report from FM Mekhlafi about the Kuwait talks. He explained that the delegation presented its political and security view for peace. The recent developments come while insurgents try to empty the public institutions replacing thousands of employees with militia loyalists in a process known as “Houthi-ing” the state.